Several months ago, I started a new weekly theme: Sundays Are For Sebastian. Sebastian is my five-year old and he says some of the funniest things–we have no idea where he gets his material since his mother and I are rather boring, serious people. …extended his middle finger, flipping me off. I tried not to be shocked. 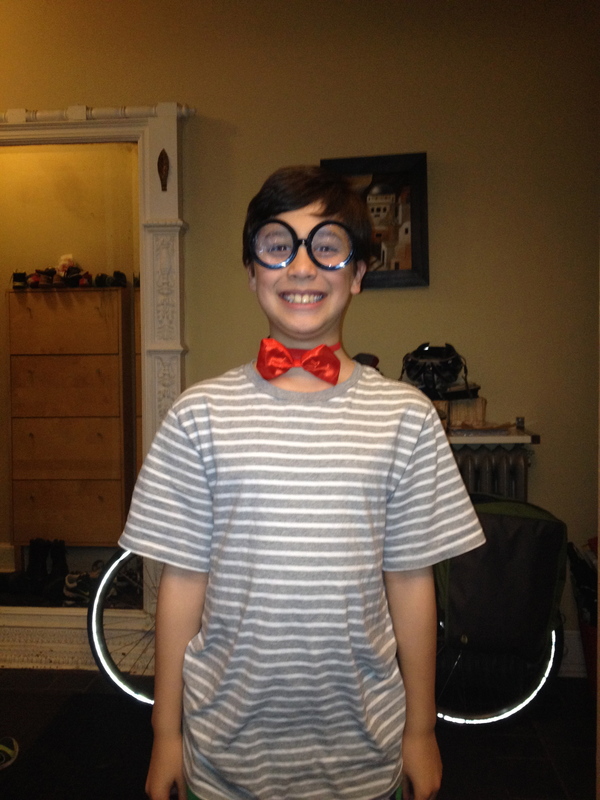 Nathan, very proud of the free Mr. Peabody glasses and bow tie he received at school. This entry was posted in Family, Humor, Kids and tagged middle finger, Seba, Sebastian. Bookmark the permalink. I was practically on the floor…. That’s a picture which should be framed! Yes, the older is now in 5th grade and starting to lose some innocence, but his younger brother keeps him grounded! Such a great name: goblins! Decidedly better than my term of “affection”: Knuckleheads…. Not sure how that will work, but let me know! I was rather startled, hoping there was an innocent explanation–I was ready to chastise his older brother for teaching him the gesture! Sebastian gets all the pub, but Nathan has his moments…. Lovely story that brings back memories when our children went through that age of innocence…. If only it never ended…. That is just too funny. He gets that a lot!